On Jan. 11, 1969, Trinity celebrated its fiftieth anniversary of coeducation. 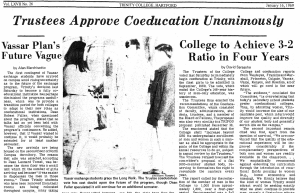 On this date, the Board of Trustees voted unanimously to admit female students to the school for the first time. A school-wide email from College President Joanne Berger-Sweeney indicated the College would be celebrating fifty years of coeducation. In honor of this occasion, Trinity celebrated “Women at the Summit” at locations across the world to mark this momentous occasion. President Berger-Sweeney’s email to the community included just a few of the noteworthy female students that have passed through Trinity’s campus. Alyson Adler became the first woman to sign the Book of Matriculation as a first-year student in the fall of 1969. President Berger-Sweeney’s email also highlighted Judy Dworin ’70, Trinity’s first undergraduate female student and a member of the faculty. Susannah Heschel ’73 H’10, a member of the Board of Trustees as well as the Tripod’s first female editor-in-chief was also mentioned in the email. The celebrations of “Women at the Summit” highlight a crucial part of Trinity’s history. Important events will take place throughout the year at Trinity and in several other cities to mark the anniversary of coeducation at Trinity. The Tripod took the opportunity to look back through our archives to find our commemorative issue celebrating coeducation at Trinity, as seen in the photos on the right.